Every year, we seem to get more and more requests for battery operated lights. The good news on this front, is that improvements are made each year and more options continue to be available! 5-10 years ago, battery operated lights were not practical. You would spend $5 on batteries and the lights would literally last only one night. Now with the popularity of LED bulbs, battery operated lights of all kinds are becoming a practical and cost efficient solution for small displays of all types. LED lights use less power, which is allowing lighting manufacturers to make longer strands of lights with battery life that is about 4x longer (3-4 weeks when run on a timer). The number one location our customers are using battery operated lights are for wreaths hanging on a front door. However, they are super handy for garlands on banisters, wreaths hanging on interior walls, centerpieces, nativity scenes, and so much more! Anywhere plugs are not handy, battery operated string lights should be considered an alternative during the holidays. Outdoors, these lights have some limitations however, because battery packs are typically not weather resistant and frigid cold temperatures could cause the lights to burn dim. The most popular options this year have been our LED 35 and 50 light options from the Vickerman company. 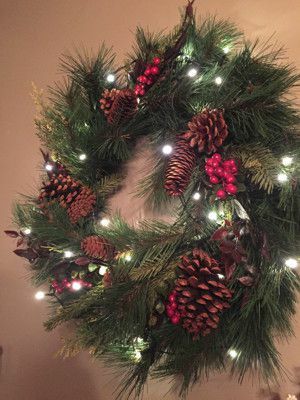 Both options are great for small decorations such as 24-30″ wreaths or short garlands and centerpieces. These lights are rated for indoor and protected outdoor use. And best of all, the battery packs have a timer (4, 6, or 8 hours on) or a dusk to dawn setting. Once you set them to what you would like, you can forget about them all season long. They come in both warm white and multi-colored. Stop in-store and see our full selection of battery operated light sets, we have dedicated a full end-cap in our Christmas department for them this holiday.